It is often the case that a valuable new industrial capability brings with it a whole new set of challenges for measurement science—and thus, inevitably, for NIST. 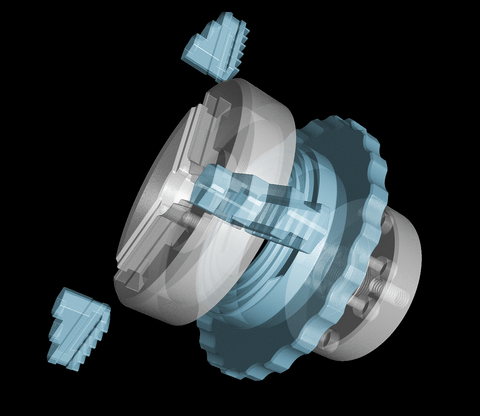 A current case in point is the burgeoning growth of additive manufacturing (AM)—the industrial equivalent of 3-D printing in which complex structures are built up by the successive addition of layers, instead of either assembling them from separate components or starting with a solid block of material from which material is successively removed, sometimes using a number of machining tools, to produce the final part. AM is already in use for fabricating a wide range of devices from medical implants to multi-material electronic components, precision fluid conduits, lamp constituents, fiber-optic connectors, and more. But the method poses problems for defect detection and quality control: The exact dimensions and fit of a device's internal features cannot readily be evaluated without destroying the device. As a result, many manufacturers have turned to a technology called x-ray computed tomography (CT), long used in medical imaging but increasingly employed over the past 15 years to examine the dimensional characteristics of commercial products. At present, however, there are very few agreed-upon standards to evaluate a CT instrument's performance or verify the accuracy of its images. That's why NIST entered into a Cooperative Research and Development Agreement (CRADA) with North Star Imaging (NSI) of Minnesota, a manufacturer of industrial digital x-ray and CT systems, which has loaned a CT unit to NIST for the three-year duration of the CRADA. 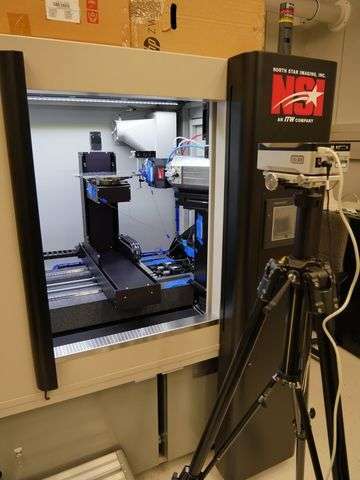 During that time, NIST researchers can use the CT system to test measurements of candidate reference artifacts that could eventually be employed in standardized testing and calibration; at the same time, the NSI system can be characterized by exacting procedures at the nation's standards laboratory. "Right now, we're mainly involved in developing very well described reference artifacts," says project scientist Meghan Shilling of NIST's Physical Measurement Laboratory. "We take an artifact designed to evaluate the performance of a CT system and measure it using our tactile-probe coordinate measuring machines, which have extremely well-established measurement accuracy. "Then we put the artifacts in the CT system, measure them, and see how the data compare. One person on our team, who is part of the Engineering Laboratory at NIST, is making metal test structures using additive manufacturing, into which he intentionally leaves some voids, which can also be imaged using the CT system. At the same time, we're also working on characterizing North Star's machine, giving them technical feedback that may help improve their system design." "The CRADA has been extremely valuable for NSI in characterizing the system for use in the refinement and enhancement of our CT system designs," says Tucker Behrns, Engineering Manager at NSI. "We have been able to gather a wealth of information through working alongside the NIST team while gaining unbiased feedback with a focus on metrological implications. The unique measurement knowledge and skills we have access to as a result of this agreement have allowed us to gain great depth in our understanding of the critical aspects of the machine function and performance." A concurrent goal is to assist in the development of performance evaluation standards that can be promulgated worldwide. "Both NIST and NSI are active in standards organizations, including the International Organization for Standardization (ISO) and the American Society of Mechanical Engineers," Shilling says. "Both are in the process of putting together standards for specifying CT systems. The only performance evaluation document that exists now for CT dimensional metrology is a German guideline, and the team that put together the guideline is also involved in drafting the ISO standard. Eventually, we also hope to be able to disseminate best practices and lessons learned about techniques and artifacts." CT works by projecting x-rays of appropriate energies through an object at successively varying angles. Different kinds of materials absorb or scatter more or fewer x-rays; so measuring the x-rays transmitted through a multi-featured object at different angles reveals its inner structure. In a typical medical CT scan, an x-ray source rotates continuously around the body, building up 2-D or 3-D images which reveal circulatory problems, tumors, bone irregularities, kidney and bladder stones, head injuries and many other conditions. X-ray CT for manufactured objects uses exactly the same principles. In the NSI instrument at NIST, a sample/test object is placed on a stage between the x-ray source and a detector plate. The sample revolves in a series of small angular increments around its vertical axis, and the x-ray beam passes through it, taking one frame of data at each position. Each measurement produces a single 2-D slice. Computer software integrates all of the slices and builds up a 3-D image. However, there are many complicating factors. For one thing, samples may contain both soft polymer parts and multiple hard metallic sections laid down in layers of melted or sintered powders. Each kind of material has an inherent attenuation coefficient (the ease with which x-rays pass through the material), that is dependent on the material composition and density as well as the energy spectrum of the x-ray source. NIST provides tables of x-ray mass attenuation coefficients for elements with atomic numbers from 1 to 92 for specific x-ray energies. But calculating the attenuation coefficient for multi-element compounds, such as plastics combined with metal, using a spectrum of x-ray energy, is a challenge. "We are able to vary the voltage and the current in the x-ray source," Shilling says, "and we can place various filters in front of the beam to adjust the x-ray spectrum that travels on to the target test object. So the system is very capable of measuring materials from plastics to steel." Depending on the customer's needs and the degree of detail that is wanted, a measurement run can range from half an hour to four hours or more. But how can the accuracy of those images be objectively evaluated? And what are the optimal ways to measure different materials and configurations? The answers are slowly emerging from scores of trials, and "developing the right settings is a bit of an art," Shilling says. Aside from adjusting the voltage and current in the x-ray beam and the filter material, both the distance between the x-ray source and the sample, and the sample and the detector, can be adjusted to achieve various effects. At the same time, Shilling and colleagues are also investigating aspects of the instrument that could potentially lead to measurement errors. "For example," she says, "as the vertical axis of the rotary table spins, we want to see how much the sample may move in other directions—up and down or side to side. That can affect the quality of the results. What we've been doing most recently is to characterize those motions on the most important axes of the machine." That effort requires sensitive capacitance gauges and laser interferometers that can detect extremely tiny changes in position. Those and other measurements will continue for about one more year under the terms of the CRADA. 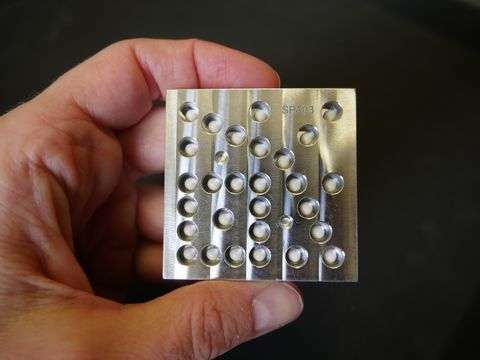 "At NSI," Behrns says, "we have seen a substantial increase in the use of additive manufacturing for production components across many of the major markets we serve. 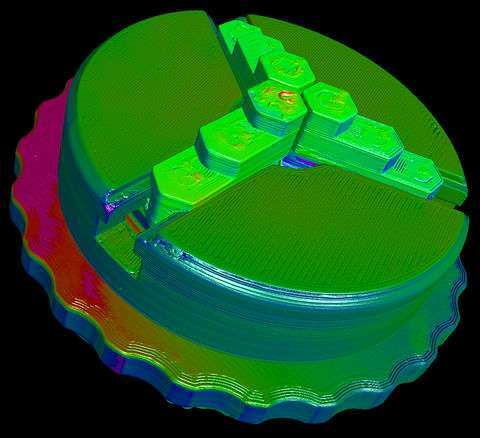 As our customers continue to expand the application of this technology, we believe that CT will play a crucial role in the identification and measurement of internal structures which is not possible with traditional methods. Working with NIST has allowed us to accelerate the advancement of CT measurement technology so that we can continue to improve our ability to serve this rapidly expanding market."